Whether you have an incredible website with all the bells and whistles or a simple setup with Punchpass as your primary online presence, there are lots of ways to customize Punchpass so it's a cohesive and beautiful part of your business. We want to help you make a good first impression. So let’s start with your “public Punchpass pages” -- this is where your customers will go to see your class timetable and pass information. To make things feel like home, we display your logo at the top of your public schedule and pass purchase pages. It's also automatically added to any emails that go out to your customers from Punchpass. We give you the opportunity to customize the name of the link that points to your business' public Punchpass pages -- so it's easy for you and your clients to remember. Easy to remember and ready to share! Now that you have a link that's ready to share, your clients can easily add one-touch access to your Punchpass public pages. They can add the icon to their home screen on their smartphone or tablet.... so they can use it like an app. It’s quick and easy and is a great way to keep your business on their mind! 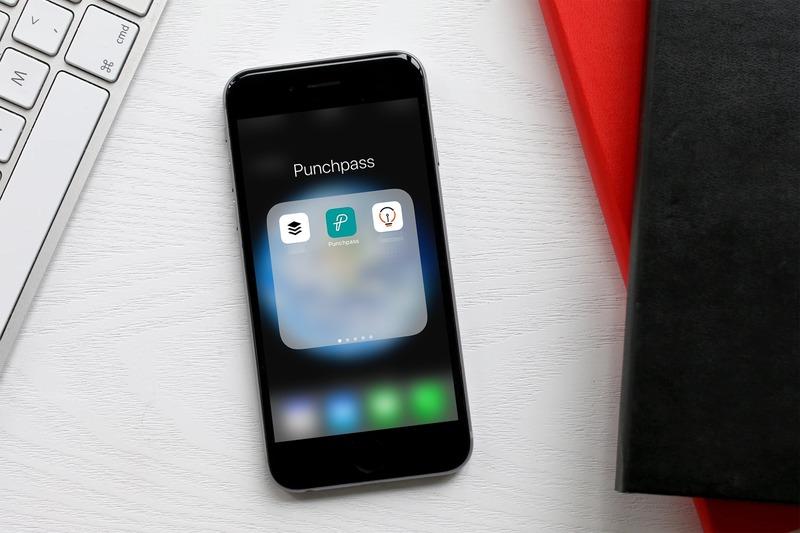 It's easy to add one-touch access to Punchpass & keep your customers app-y! 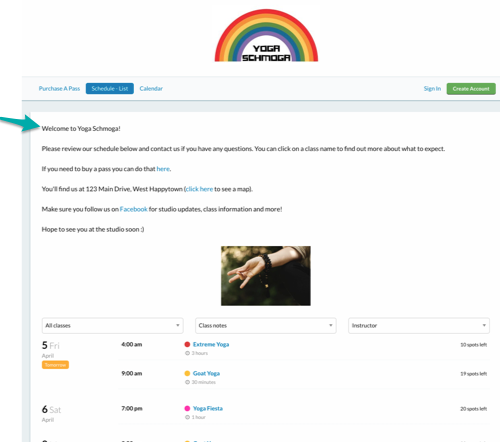 You can write whatever you want at the top of your Punchpass schedule - it’s a great way to communicate any updates, special offers, booking terms, new classes etc that you want your customers to be aware of before making a booking. You can include images and links in this area and edit it as often as you like to keep the information fresh and relevant. It’s like an online bulletin board for your business! We think that giving your customers as much relevant up-front information as possible is one of the best ways to keep your business running smoothly behind the scenes (which gives you and your staff more time to focus on other things!). 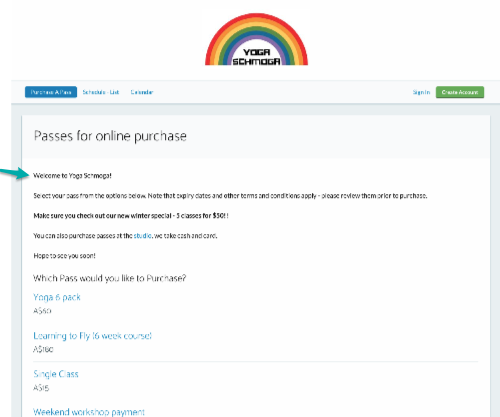 If you're selling passes online, you’ll have a separate (but nicely integrated) Punchpass page for your pass sales. You can add a different set of information to the top of this page. It’s a great place to spell out any payment policies, specify whether your prices include tax, promote any new passes you may have on offer and communicate anything else you’d like your customers to be aware of before making a purchase. If we’re going to be sending your students to your Punchpass pages then we want to make sure they look awesome and provide the perfect amount of information – not too much, not too little. So in addition the main link to your Punchpass pages, you can use other unique Punchpass links to create filtered and targeted versions of your timetable. So you can add as many options as you like to your website so your customers (and potential customers) can easily arrive at the exact information that they’re looking for. For example, we let you apply custom filters to your schedule & grab links that provide that filtered view. So you can display different versions of your timetable to different audiences. You can include these filtered links on your website, in your email newsletters and social media posts. Want to break things up by location? Or Instructor? Your link can show the proper subset of classes that meet the criteria. If you're offering a workshop, you can send folks directly to the proper signup spot. Or if you want to feature a particular pass or membership, you can send people right there. So you can describe each of your offerings exactly as you like. You can include images, links... even a short video if you like! If that all sounds exciting then the best news is that we’re always making improvements to Punchpass and your options are only going to expand from here. We’re currently working on more options for making connections to your other favorite online platforms. Do you need help figuring out the best options for you and your business? Our support team are happy to help guide you through the setup process so you can get everything just the way you want it. We’re happy to talk to your tech people too! We’d love to work with you and your business - sign up for our free trial to explore for yourself or get in touch to find out more! More Posts we think you might like!